I know, I know. We're all so over the heat. 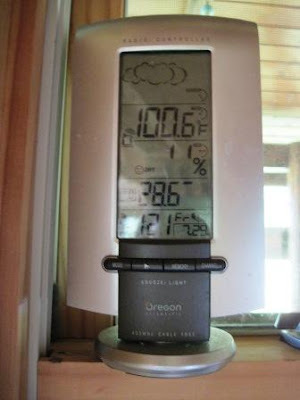 And yes, this picture is from our thermometer on Two Bears Farm. Whew, it's hot out. So hot out that the humidity gauge on our thermometer thing broke. But I dare say the alternative IS worse. I'm not a winter person, so whenever I get to complaining about the heat, I just have to remind myself to be thankful. Why? See, come on, now don't you feel just a little bit better about the temps?!? It really could be worse! What's something that you DON'T miss about winter? We soon get tired of too much hot weather here too in Blighty. We could do with some over here at the moment though. Brrrr! You are so right! It could be much worse. Oh, you have hit the nail on the head with this one! I'll just add my own version of one of yours: I love being able to go out for my morning walk without: 3 layers of clothes, 2 pair of socks, mittens, a scarf, a heavy coat, ear muffs and a hat. And I'm still cold! :O), all very good points will try to remember them as we are hitting 108 and 109 several days this week. I don't miss using 100 lbs of salt on our drive only to have NOTHING melt because it's -30. I don't miss Michael's normal 40 minute commute taking 2 hrs! Okay, I understand that some things about hot, humid weather are much, much better than the alternative (no icy roads, no scraping windshields, no shoveling the driveway/sidewalks, etc). However, I love fall the best - not hot, and not cold! I like your reasons, but in Georgia - I don't wear a heavy coat at all - and a lot of people do wear shorts - go figure . . . Here it always snows and then melts and then freezes-and going anywhere when the streets and sidewalks are a sheet of ice is a sheer nightmare. I'd also agree with everything on your list too! I agree with you 100% Lisa. Don't really like being snowed in if the hubby's working out of town. Actually, I don't mind winter at all! I believe I like most of the seasons equally. Spring is very drab and muddy where I am. So March and April are my least favorite months. You must not have been going out much lately because of the heat but most stores already have Halloween and Thanksgiving already out! I about died when I seen it and that was a good 2 weeks ago! I just want temps in the 70's for a few days so we can do something outside. You have some great points! Sorry, Mama, but bring on the cooler weather! I'm a Northern girl, remember? I love fall! Maybe not the snow, but fall - ah, heaven. ;) 100+ degrees? Screw that! We're off to the pool! Great reminder! When we don't like the weather we're having, it's good to remember how much worse it could be. You have put such a good spin on this, and I agree completely!! My personal favorite is not getting dark early. I HATE when it is dark at 5:00!!! And also hate the ice!! It may be hot, but at least we are not snowed in with the power lines down! What I don't miss about winter is winter itself. Our winters here are more like fall time. A couple of cold snaps but mostly sweatshirt weather. And we never get into triple digits. The summers just last longer. You are so right about the laundry thing. I always dread the loads of heavy clothes in the winter. It's miserable out there, but I'd rather it be hot than cold!!! Yes, a great reminder. I don't like driving on snowy and icy roads. And my van takes about twenty minutes to heat up so we are always freezing when we run errands. I love the summer weather~ people are complaining about all this heat.. I tell them I'll talk to you in 6 months see what you think.. I tell people this is great~! My favorite season is just around the corner - fall! Haven't met one yet I didn't like! Love winter - but ours up here in Canada are too long. Summer is pleasant - usually - this year more rain than we would like. I love our summer late nights - gets dusk around 11:00 and light again at 4:00 a.m. Fantastic - makes up for the short daylight in winter. Our spring is lovely - but far too short! You've got high heat now - but that too shall pass! Well you're right-we can't do nothing about the heat we might as well look on the bright side! Great post. Hhhmmmm. Well, here in Washington it's been mid 70's to 80's, so Winter isn't even on the brain .. in fact, summer just now got here! Winter .. well, our winters are pretty tame. Maybe snow once or twice for a day or two, but usually about 40˚-50˚, so I can't complain about winter either ... which is why we live here LOL! This is why I left Florida.